I would like for you all to join me in congratulating the Faculty and Staff members of the Month for October. These outstanding team members have gone above and beyond the call of duty for the betterment of our district. If you see them in your hallways or on your campuses please congratulate them. 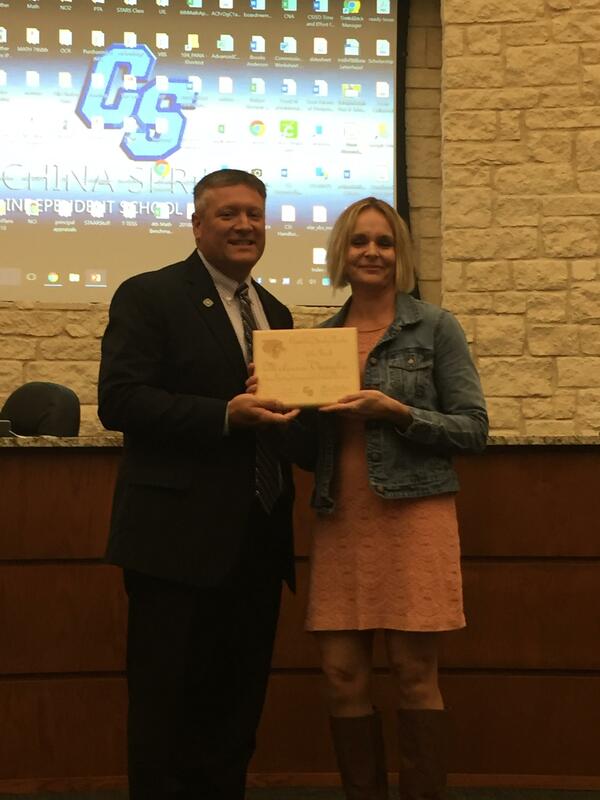 Elementary Faculty Member of the Month – Congratulations to Melissa Vaughn, first grade teacher, on being nominated and selected as the Elementary Faculty Member of the Month. Regina Day, Reading Interventionist, stated “Mrs. Vaughn is an amazing teacher. She is extremely dedicated and goes above and beyond for the students in her classroom. She is always coming up with creative lessons that keep students engaged and help them explore learning through various methods including technology, hands on, project based, and cooperative learning. Mrs. Vaughn has also sought grants from outside sources to help fund exciting new learning tools for her students. I'm always excited to go into her classroom and see what activities her class is working on. She is extremely organized and knowledgeable, and knows her students well. Her love for children and teaching is evident in everything she does.” Her fellow team teaching partner, Tricia Begesse, stated “I feel blessed to have had the opportunity to work alongside Mrs. Vaughn. She has a true passion for education and meeting the individual needs of every child in the classroom. When Mrs. Vaughn sees a struggling student, she will research to find resources that are needed to help. She always seems to be in on the cutting edge of new teaching methods. She supplements learning through STEAM activities giving all kids the chance to create and explore their interest. Even when she doesn't have the resources it does not stop her; she will just write a Donors Choose and get the supplies she needs. 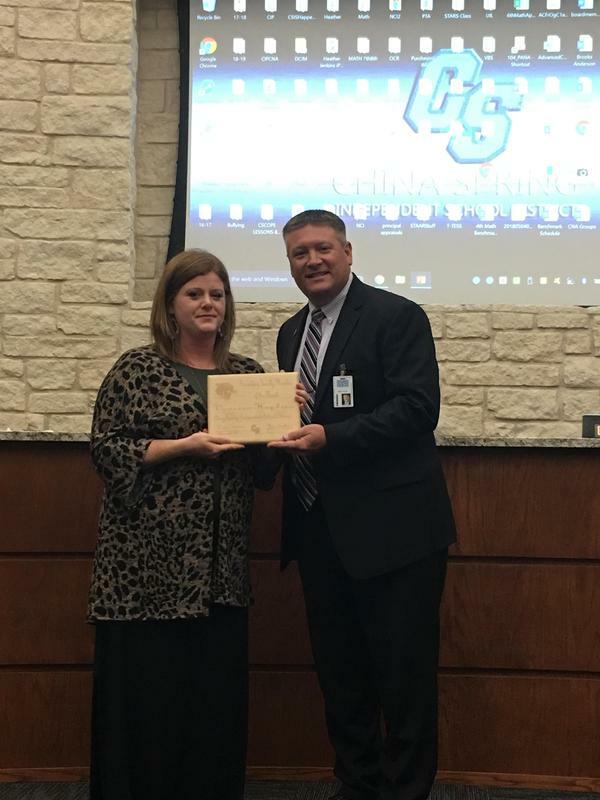 Mrs. Vaughn is definitely deserving of recognition for her commitment to China Spring Elementary.” Congratulations to Mrs. Vaughn! Secondary Faculty Member of the Month – Congratulations to Mrs. Vanessa Hopkins, Math Teacher at the Middle School, on being selected as the Secondary Faculty Member of the Month. Vanessa Hopkins is very deserving of our October Faculty Member of the Month as everything she does is perfectly aligned with OUR WHY. She goes out of her way to make learning relevant and engaging for her students. Her students are consistently up moving and doing interactive hands-on instruction. Technology is used in her classroom on a daily basis to enhance learning and make it meaningful for students. In addition to students using technology, Ms. Hopkins also goes out of her way to keep the parents involved and aware of what the students are learning about in class. Ms. Hopkins videotapes herself solving problems and giving helpful hints to help her students and parents and then posts it to her YouTube channel. She also posts helpful information to her Google Classroom. Parents are constantly complimenting on the fact that Ms. Hopkins’ videos have helped them be able to assist their student in solving new types of questions that would have otherwise been difficult. Her videos are funny and she really tries to make learning math FUN and COOL for middle school kids. Her students get very excited when she gets new followers to subscribe to her YouTube channel and they try to cheer her on to have the most! She is a go-getter that will jump in and help out with ANYTHING and I mean anything that is needed. She even picked up an afternoon bus route to help out. She is a wonderful leader on her Math team as well. She knows her content and is always open to trying new ideas and collaborating together with her team to provide engaging learning experiences for her students. She will even dare to do a sugary lemonade lesson to help the students understand the real life significance of proportions. She works extremely hard and is friendly and helpful to everyone on a daily basis. We are very thankful to have Ms. Hopkins in our CSMS family! Congratulations and Thank You so much for your passion in teaching our kids and for your love of our middle school students! Staff Member of the Month – Congratulations to Kara Turner, Health paraprofessional, on being nominated and selected as the Staff Member of the Month. Mr. Gilbert, Assistant Principal, stated, “Mrs. Turner is the epitome of a “go-getter.” She can always been seen lifting a hand with any task that needs to be done, with a grin from ear to ear. Mrs. Turner’s servant’s heart shows in her daily interactions with students, teachers, and parents. She has done a wonderful job in her new position as the Health paraprofessional. Whether they are learning about safety, community helpers, or ways to show kindness, Mrs. Turner teaches valuable, life-long lessons every day to her students.” Her Principal, Mrs. Coe, stated, “This is Mrs. Turner’s second year working at the elementary school. She always reports to school with a smile on her face and a positive attitude. Mrs. Turner is a true go-getter and serves her position with such grace and kindness. She exhibits endless amounts of patience with students and her love for them is evident in all she does. Mrs. Turner has a strong work ethic and will jump in and help out with anything that is needed. She is also a faithful servant of God and prayer warrior who brings that faithful heart to school. Just a couple a weeks ago, Mrs. Turner and Mr. Ditto heard of a need from one of their morning bus route parents. Through China Spring Cares and donations that Mrs. Turner and Mr. Ditto were able to collect, they helped serve this family well in their time of need. This is just one example of how Mrs. Turner serves others. 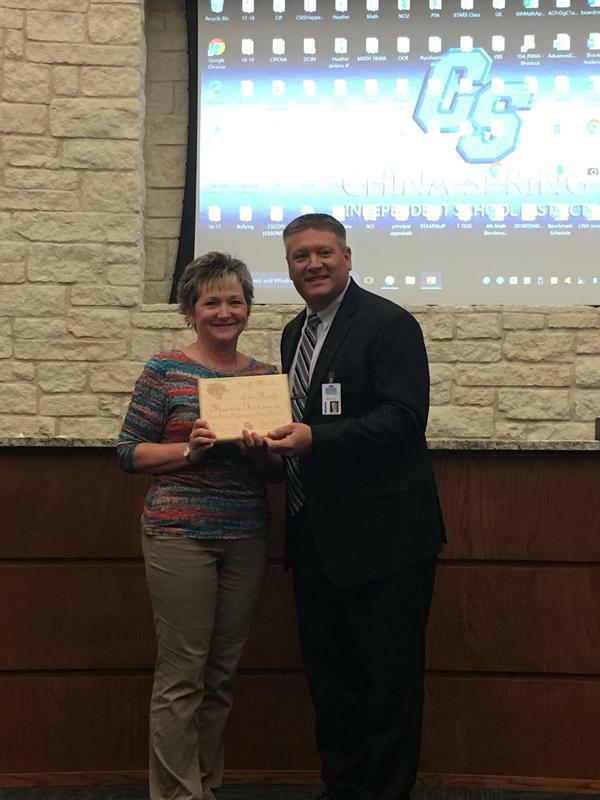 She is a true asset to our campus and we are blessed to have her as part of our team!” Congratulations to Mrs. Turner!